The American cowboy hat, as we know it today, didn’t exist in the 1840’s. Hats worn by those legendary mountain men were generally made of pelts; a few of wool for the hunters and trappers who ventured into town for supplies. Moving west hats were generally a sign of a profession, or reflections of cultural practices. Hardy men trailing cattle wore a variety of styles, shapes and materials to fashion their head gear. The traditional Chilean horsemen wore what is called the Chupalla. They were first made of a plant named the bromelia which locals called achupalla. Now they are made of rice and wheat. The Chupalla was also used for a traditional Chilean folk dance. However, with the high cost of hats now a day, it is difficult to see any wage earning cowboy stomping this valuable accessory into the ground with dirty boots and spurs. Today there is a well-respected cowboy and one of the original “horse whisperers” who is generally seen wearing a version of the Chupalla. Buck Brannnaman has long been admired for his skill with a horse. Perhaps Brannaman’s easy going mannerisms; laid back way with horses is symbolized perfectly by the phrase “por la chupalla” which loosely translates to “what the heck”. Or perhaps he is a great Chilean dancer. Around 1865 John B. Stetson traveled west in search of a drier climate for health reasons. He was the son of a Philadelphia master hatter and learned his skills working with his father. Although hatters were not well thought of in that time period, looked upon as lazy and unreliable, Stetson eventually proved that myth wrong. During his journey west he demonstrated to his companions how he could create felt out of working fur and shaped it into a large brimmed hat. Even though his friends made fun of his extreme design, Stetson liked the way it protected him from the elements, created a unique image and perhaps covered a bald spot. The hat was later named, “The Boss of the Plains”. Perhaps Hollywood’s Tom Mix carried on the daring fashion statement of the 10 gallon hat to woo audiences. John B. Stetson changed the berated image of a hatter to become a successful, influential and respected business man. In 1872 Montgomery Ward opened, offering store bought clothing to rural America. At first only selling a wide brimmed hat called the “Men’s Panama Hat”; four years later they introduced the “Men’s Planter’s Hat”. 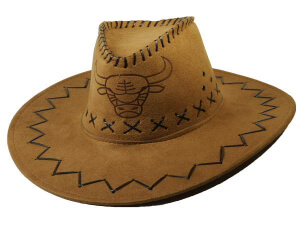 The rounded crown and smaller brim could be molded to adjust to the individual personality of the cowboy. The smaller brim was also a better fit for the winds of the prairie. In the 1920’s, millionaire E.R. Byer invested in hat maker Harry Rolnick. His unique creations caught Byer’s eye and in 1927 Byer-Bolnick started their business in Dallas, TX. Later they would create the Resistol hat line meaning resistant-all weather. Now hats come in a wide range of styles and colors. There is a style for everyone. Some interesting ones say a lot about a person. No matter what your style is, be comfortable and enjoy your cowboy experience. Jackson Hole has a variety of outfitters that want you to be comfortable on your family vacation. Look around and find the hat that says, “I’m having a great time here”. And, if you forgot your hat for your Guest Ranch Vacation we have a variety of sizes at Goosewing Ranch to help protect every buckaroo! Cowboy lore: never put your cowboy hat on your bed. Also, don’t eat peanuts before a rodeo but that really doesn’t have anything to do with style, just thought it was interesting.